Private banqueting is available for up to 150 people in the hotel's stunning Hermiston Suite. 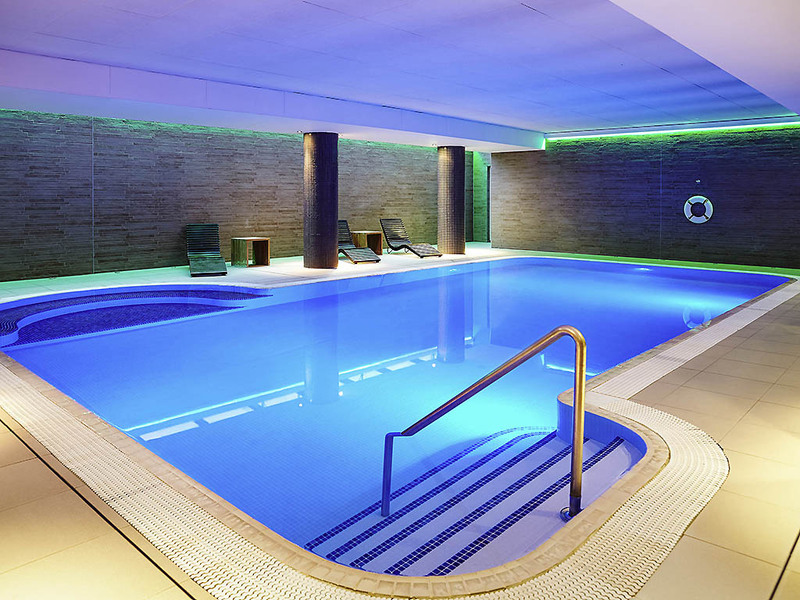 Guests can also enjoy complimentary use of the indoor swimming pool, gym and steam room, while there's plentiful on-site parking for your convenience. The hotel is located just two minutes away from public transport links transporting you to the city centre of Edinburgh where you will find an array of attractions and restaurants to visit. Edinburgh International Airport is also 4km away from the hotel. We stayed here the night before going to the theatre on a DBB rate. The hotel entrance was very nice and we were welcome by the reception staff. Check in was very straight forward and the room was great. Clean, spacious and comfortable. Our dinner was delicious and amazing value! I'd recommend the steak. The pool itself was nice and clean. Although no separate Jacuzzi, there was a bubbly seating area in the pool. There is a steam room. The only negative thing was the changing rooms. The majority of the lockers were out of order so wouldn't recommend taking valuables to the pool. The towel bin was overflowing which meant there were a lot of towels lying on the floor. It was a shame as overall the hotel was spotless. The breakfast again, was fantastic. Great selection and service too. The hotel is 5 mins walking distance to Edinburgh park tram and train stations. I'd definitely recommend Novotel and will be back in the future. Though my room is partially paid by points , there is a part that I’ve paid by credit card. Le clubaccor points should be though credited to my account for that part. This is not the first time that happened here. The best hotel we have ever stayed at! Amazing experience. Staff 1st class. Daniela is an angel who is an asset to your team. IIaria was also amazing with her brilliant artwork. This is the most family friendly hotel we have ever stayed at. This was our returning visit after being so impressed by our 1st visit. This will always be our 1st choice hotel for Edinburgh. Cleanliness in hotel is spotless including rooms and pool/gym area. Breakfast is plentiful and staff at breakfast very helpful and courteous. Marek the chef left us a beautiful sweet platter in our room as a returning guest which was amazing - thank you. We will definitely return. Helpful and attentive staff, modern and fresh clean decor with amenities to provide a quality experience. Everything was superb for the rating of the hotel. Booking made very easy two adjoining room due to one member of family with a disability, thanks To Piotr. The staff at the hotel are friendly and efficient and accommodated everything. The lady at breakfast even remembered my son is Coeliac from a previous stay and gluten free cereal and toast was provided before we could even ask. Can’t speak highly enough. If you are coming to Edinburgh the tram is 2 minutes walk away and frequent from early to late this is a great option. Lovely Hotel in a great location. The hotel is really easy to get to and is located within easy walking distance of transport links into the city, so it was a perfect base for exploring Edinburgh. The hotel staff were all lovely and helpful. The pool facilities were excellent. The restaurant was ok too, albeit there was a communication breakdown between the front of house staff and the kitchen, meaning we waited an awfully long time for food. The waitress did offer a complimentary drink while we waited which sweetened the wait slightly. We will definitely go back to the hotel when we are next up in Scotland. Nice decor around bar lounge and breakfast areas. Welcoming staff. Holiday gifts for children appreciated. Great price for family stay. Excellent breakfast choice. Room lovely and upgrade welcomed as request for bath and shower was accommodated. Lovely room, kids loved the warm pool. Nice hotel, nice atmosphere and although it was busy this never caused a problem. Very friendly and helpful staff. Great location next to the tram and rail stop. Only issue is that the road noise from the Edinburgh bypass is quite loud, particularly if you're at the front of the hotel. Lovely single night stay. Friendly staff, nice room, great breakfast. A most enjoyable two day stay at the hotel while my wife was attending a course at Napier University. The room was spacious and very well appointed with a fridge, kettle and TV. Excellent restaurant and great staff made the evening meal a pleasure. Great leisure facilities with a good gym, pool and steam room.. Communal changing rooms a bit cramped and floor soaking wet and very steamy! Lock on locker was temperamental and didn't work - sometimes! All in All a great hotel in a great location with perfect access to the rail & tram station. Good parking facilities which was £4 per day. Would return though! Very comfortable room with great amenities. Great to have a fridge and safe. Although the shower was big I had to put a towel on the floor as it flooded due to the glass panel not being wide enough. Would prefer a door on the shower. Staff were excellent. Was a good stay. Iolena cleaned by room and I liked the little well spotted things she did, such as not put back the pillows that I don't use on the bed.